An Irish Round Tower is not any old tower. It’s not a Martello tower – those are the squat round towers dotted along our coast and the coasts of England and Wales, built during the Napoleonic wars to fire up warning signals if Bonny came calling. Nor is it a Norman tower house – those are the plain square towers you see all over Ireland. We have one of those in my home town of Clondalkin. It’s called Tully’s Castle and it has its own legend of thwarted love, cruel fathers and violent death, but it’s only a side note to Clondalkin’s main claim to fame – our beautiful 10th century* Round Tower. Irish Round Towers (note the capitals) are uniquely, well, Irish. There are around 65 in number, though the total depends on who’s counting. Some scholars only count the freestanding Round Towers, not the ones ‘engaged’ or attached to church buildings; most count all remaining stumps and bases, some count foundations. No one counts revivalist round towers, 19th century pastiches such as the one at Daniel O’Connell’s grave in Glasnevin. Round Towers were built over a 250 year period in the 10th-12th centuries. Wherever you see one, whether in the middle of a bustling town, like the one in Clondalkin, or standing alone in the middle of a field, that tower was once at the centre of an Irish monastic settlement. * Clondalkin’s monastery was founded by Crónán Mochua in the late 6th/early 7th century and the tower was probably constructed in the early 10th century. 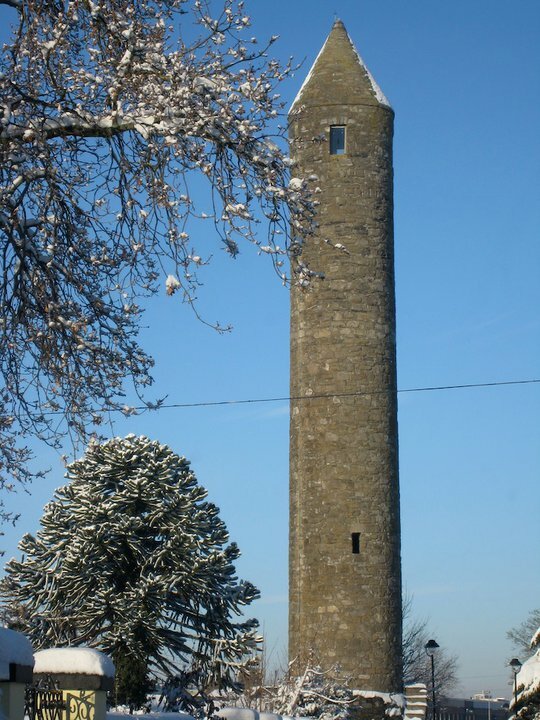 Clondalkin’s tower is one of the earliest towers – it is plain and made of local stone. ** It is the narrowest, and one of the most complete. It still has its original cap – the only complete tower whose cap has not been reconstructed or reset, according to Brian Lalor. Most caps, including that of the Glendalough tower, are 19th century replacements. It is smoothly cylindrical inside – most of the towers interiors are constructed like stacked upturned buckets. 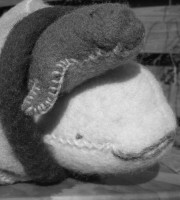 It is the only one with a bulge at its base, probably added as a buttress. It seems strange now that there was ever any doubt that the Round Towers were part of monastic settlements and it’s difficult for us to appreciate how truncated the past appeared to people back in the early 19th century. Today it is accepted that the towers were a central feature of monastic enclosures. We know from the annals that they were used for housing precious objects but it seems most likely that their main/original purpose lies in the Irish name for Round Towers – Cloig-theach, which means bell house. Perhaps a bell was rung from the top floor to sound prayer times to the community working below in the huts, gardens and fields. Lalor and other scholars suggest our towers are part of a broader culture of bell towers (campanili) erected at religious centres in Ravanna, Rome, the Rhineland and elsewhere in Europe, towers which may in turn have been inspired by Islamic minarets. Until the 1990s you could climb the Clondalkin Round Tower. Every kid in the village knew that the O’Connors at Mill View were the keepers of the key. You knocked at their door and they handed it out, along with a torch. You climbed the steps (not original) to the door, unlocked it and then climbed the long tapered ladders four floors, hauling yourself through each hatch onto wooden platforms. Scrambling on your hands and knees it’s rather alarming to realise that the platforms are just a single layer of side-by side, not especially thick, planks. There are chinks; you can see the drop below. At the top of the tower are four windows facing the cardinal points. I climbed it with my gang of Ranger guides circa 1992 on a gloriously sunny day. Clondalkin is 60 metres above sea level and the view 27.5 metres above that is amazing. Up there looking out it’s hard not to presume that this is one of the functions of the towers – to provide a 360 degree view of the surrounding land. Monasteries were the power centres of their day and housed treasures well worth looting. The view from the top would have provided an early warning system. **** In turn, the towers could also be seen from a distance in the medieval landscape, so pilgrims travelling from one monastery to another had a distinctive imposing landmark to guide them towards their destination. You can visit the new centre in Clondalkin, Brú Chrónáin, read up on Round Towers and develop theories of your own while enjoying the tower in its wonderful new garden setting. You can join a guided tour with a local guide to tell you the history of the site, and then stop and eat something scrummy at the new Happy Pear restaurant. Fáilte is fiche! * There are 3 in Scotland and 1 on the Isle of Man, later towers, derivations of Irish Round Towers. ** Early towers were plain, later towers were built with support of wealthy patrons and could therefore use materials brought from further afield. Door lintel type is also indicative of an early date. *** There is a possibility that the towers were consider sacred places in which one could claim sanctuary, which would not necessarily have been respected. The annals record several deaths in Round Towers including the murders of two kings. **** In fact some towers were adapted for just that use in the Middle Ages, caps removed and battlements added. But O’Keefe dismisses/Lalor questions the idea of the towers as lookouts as some of them don’t provide a particularly good view from the top.